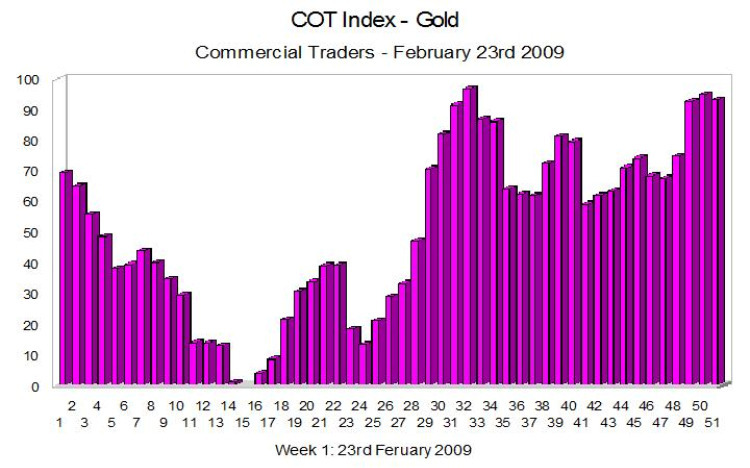 In the last two weeks the COT index has begun to climb heading back up from the low of 15 weeks ago which suggests that the commercial contract holders are increasingly seeing an opportunity to sell into the rising prices in spot gold, which touched $1000 per ounce on Friday, before falling back to close just below. From the above we can assume that we are some way from the peak for spot gold prices, and can therefore assume that this is another indicator that the bull trend in gold is set to continue for some time yet. Naturally once the COT index starts to approach 95 then this will be our first warning signal that the bull trend is coming to an end. For a daily update on spot gold prices please just follow the link here.